Lucky for us, many cosmetic companies label their products with expiration dates even though the FDA doesn’t require it. 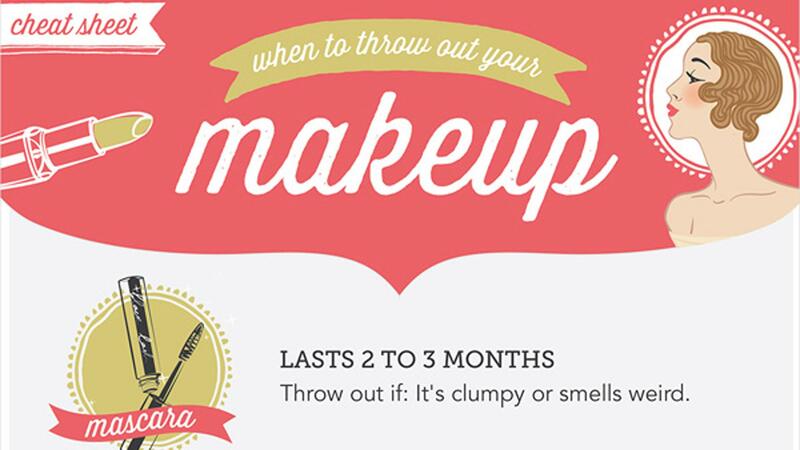 Unlucky for us, expired makeup isn’t as cut-and-dry as expired food. Because of the lengthy list of ways we abuse our cosmetics (like letting our BFFs use our mascara), there’s a good chance our makeup is kicking the bucket even sooner — and our skin is paying the price. Although makeup does include preservatives meant to kill bacteria from everyday use, they’re not exactly Kryptonite. The second you open your new beauty product, it’s subjected to airborne bacteria (and other forms) each time you use it — then, you know, you start abusing your makeup by storing it in the bathroom, sticking your paws in it, sharing it with friends, and oh yeah, cleaning your makeup brushes once every decade. Small amounts of bacteria, while uber-gross, aren’t the end of the world (that’s what your immune system is for). But over time, the bacteria grows and becomes more dominant, especially as the makeup ages and loses its “strength” to fight against it. The composition of the makeup changes and turns into toxins, which is why expired makeup often changes color or smells funky. When its active ingredients and stabilizers break down, the risk of your makeup carrying an infection increases and can turn your face into one hot mess. Your makeup brushes and sponges are in your bathroom, partying it up with the airborne viruses. As you use them, you transfer those viruses into your makeup and onto your face — do this again and again, and your eyeshadows, blushes and foundations become nasty little Petri dishes. Blech. “As bacteria develops within makeup, it can cause irritated skin, breakouts, redness, as well as visible protein build-up under the skin’s surface,” says Amanda Gabbard, beauty specialist and makeup expert at the Waldorf Astoria’s Guerlain Spa in New York — not to mention boils, rashes and dermatitis (little red bumps that look like acne). As for expired mascara, “Potential hazards from expired mascara include itchy, watery, red eyes and in severe cases, conjunctivitis (pink eye),” says Cecilia Wong, founder of Cecilia Wong Skincare. Products that contain mainly water have the shortest shelf life because water encourages bacteria growth, as do products that are mostly waxes or contain plant extracts. You should be extra careful with products that are preservative-free, since the preservatives are often what fight against bacteria growth. Powders and other products that contain barely any water last the longest. Keeping track of when your makeup expires based on when you first open the product (keep a Sharpie in your makeup bag to conveniently mark each one). Storing your makeup in a cool, dry place and regularly cleaning your makeup applicators (or regularly changing disposable ones). Doing a periodic check of your makeup by using the infographic above.